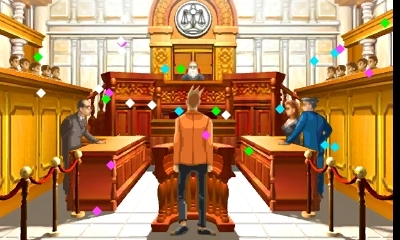 The first game, Phoenix Wright: Ace Attorney benefits by being the series launch title. It felt fresh when first released, whereas later entries adopted more or less the same format. The stories still have a very good flow to them and tie together in unexpected ways, making the final case particularly exciting, memorable, and satisfying. 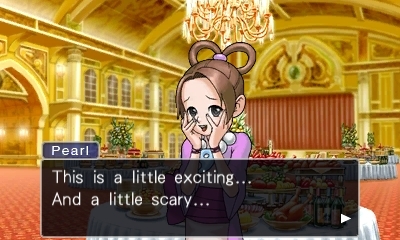 The first of many court victories for Phoenix Wright. 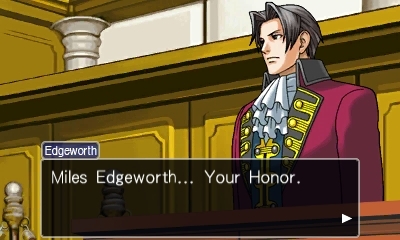 Edgeworth set the standard for other prosecutors that followed. … one that took advantage of the hardware. 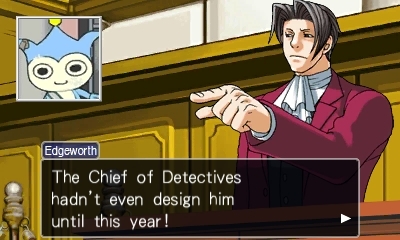 The début also has the best prosecutor of the series, Miles Edgeworth, who was popular enough to get two spinoff games of his own. He features prominently through most of the game, and is a very well-developed character. 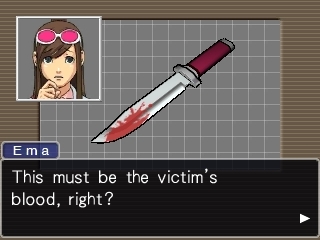 The fifth and final case (a DS bonus not found in the GBA original) makes use of the systems unique features. It also introduces Ema Skye to the series. This exclusive chapter can definitely have an argument be made that it is the best case of the original trilogy! Justice for All is the second game, and less satisfying in many ways. Apparently it had a number of development issues which does make its shortcomings more understandable. It has one less chapter than its contemporaries, and none take special advantage of the DS hardware. Some plot lines are redundant, and they don’t gel together nearly as well as the first game which makes the stories weaker overall. 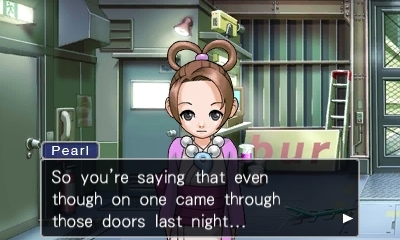 It also introduces more supernatural elements, with Magatama and Psych-Locks among them. These are weak and don’t contribute a whole lot. 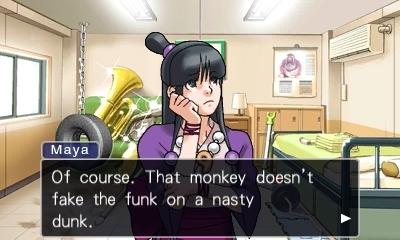 They’ve also since been bested by alternative techniques such as Apollo’s perception of nervous ticks, or Athena’s computerized necklace. The difficulty level has increased, and even something as basic and simple as pressing a witness can punish you with a game over! 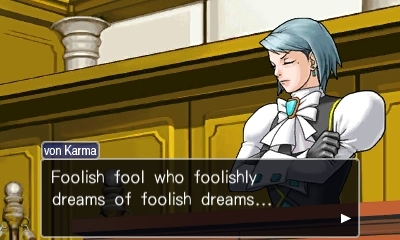 Franziska von Karma means business. 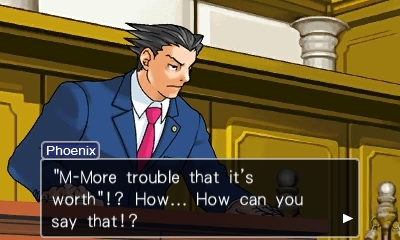 Even a flustered Phoenix can still crack a joke. Maya showing off her knowledge of mid 90’s pop culture. Pearl Fey makes her series debut in Justice for All. There are some improvements with Justice for All however. Being able to click on character profiles when presenting evidence was a very welcomed addition. The game also established the blend of returning characters, with new ones making their series début. 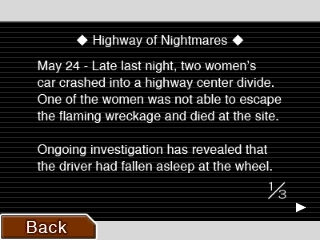 And Justice for All having two different endings is a small but nice touch. 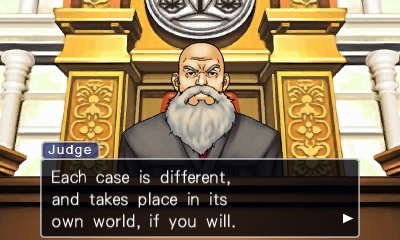 Trials and Tribulations starts off brilliantly, with one of the series best cases in my opinion. 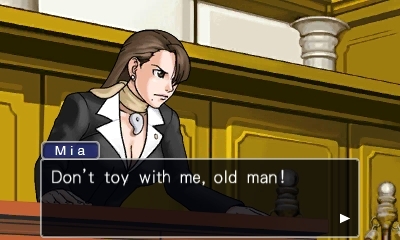 A flashback episode that has a younger Mia Fey defending Phoenix Wright as a law student, offers a refreshing take on the opening trial. 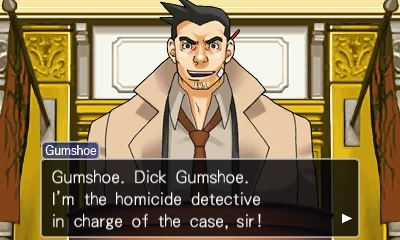 The flashback method worked well enough to be used later in the game which also shows a younger Edgeworth, Gumshoe, and others. These are Mia’s best appearances in the entire series, and you can see how her mentoring shaped Phoenix. Flashback episodes easily show Mia at her best! 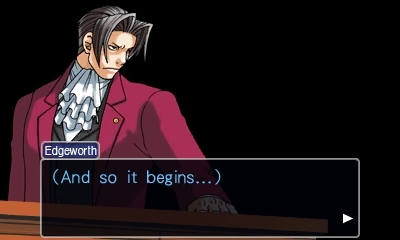 A younger Edgeworth sporting his unique style. 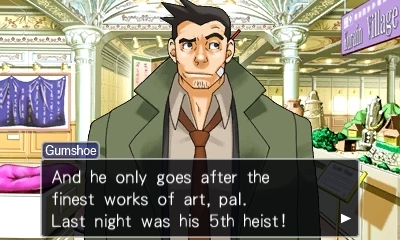 Gumshoe, minus his usual green jacket. Most of the other cases fare comparably. Case two starts with a focus on defending an accused thief rather than launching with the usual murder angle, while case three has you fighting to overturn a trial whose verdict has already been decided under unusual circumstances. 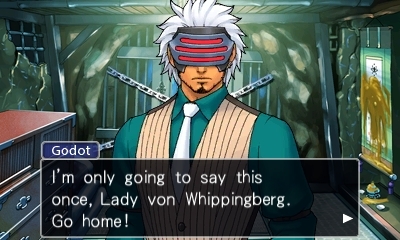 The new prosecutor, Godot, is an improvement over the memorable but vexatious Franziska von Kara from Justice for All. Godot might be the coolest character in the trilogy, with his cryptic remarks, accompanying slow jazz music, and his passion for coffee. A brief break from the typical murder cases. 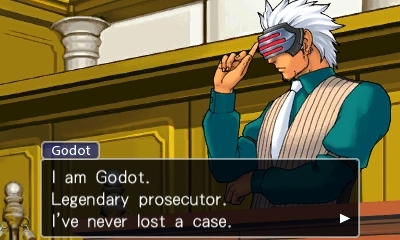 The cool and mysterious prosecutor Godot. 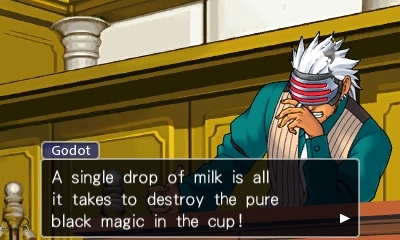 Godot speaks words of wisdom. 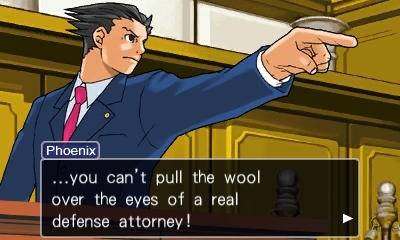 Phoenix again getting abused by the prosecution. 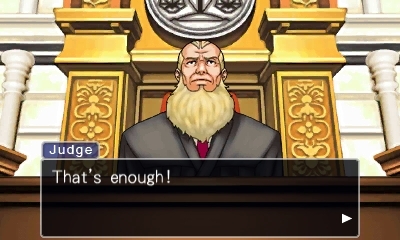 This judge looks a little … different. Godot is intimidated by no one! What’s new for those who’ve experienced these titles prior? Not very much, although that’s not necessarily bad. The graphics are redrawn, and the 3D support is nice and appreciated. And Miiverse is cool for those times that you may get stumped. Otherwise the draw of this package is the convenience of having all three games together, and the $29.99 asking price for what is dozens of hours of content! It must be acknowledged however that the HD iOS version is half the price. You can play the three games in any order you want. While each entry does a respectable job of limiting confusion for new players, it really is best to tackle these games in the order they were released. I played them out of order back in the day, and though I still enjoyed them I definitely feel I would’ve had even more fun had I played them as intended. Putting all nostalgia aside, admittedly this collection of games is not perfect. The aging character animations and lack of reworked, CD quality sound stand out. The fact that saving still boots you back to the tile screen is annoying, and the returning typos are tough to ignore. 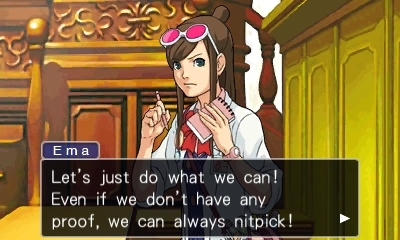 The novelty of yelling “Objection” into the microphone has likely worn off for most. And of course the games have their linear nature, meaning you may figure out solutions long before you can start working towards them as you’d like. 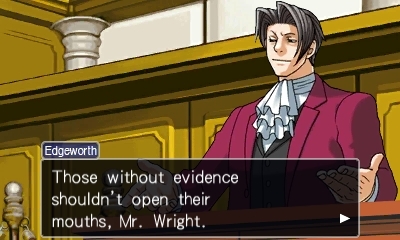 Evidence will make sense, yet won’t be what the game wants, or correct evidence will fail from being presented on a statement the game’s decided is wrong. 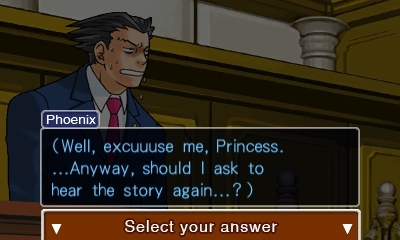 Phoenix looks embarrassed by this typo. Even cute little Pearl isn’t immune from typos. Frankly the biggest obstacle to the games in this trilogy might be that later games in the series have surpassed them so much. 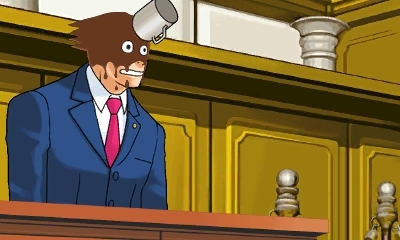 Apollo Justice, Dual Destinies and Layton vs. Wright have refined what worked well, and lessened what wasn’t as successful, while leaving lasting impressions. They improved their storytelling, added new abilities like rotating around scenes, and made clues (and the timing of their presentation) less obscure among other things. This trilogy is still good for sure, but it does feel a bit more dated than I anticipated. Nonetheless, if you missed these games originally it’s hard to argue that this collection isn’t a must own. Even if you haven’t played all the games, chances are that if you enjoyed one you’ll enjoy them all. How much more can be said? This is compilation of some of the most beloved DS games ever, and the value of the sheer amount of content simply can’t be overlooked! Indeed, the whole Trilogy adopts its own world. They’ve since been surpassed, but this collection of classics is content rich and entertaining!